Jason Howard is the site administrator and the author of the Korean Genealogy Guide. You can contact him via email at: korea.genealogy@gmail.com or by posting a comment below. I read on another website of how Koreans name their children using dollimja (돌림자) and that the placement of the dollimja in the given name alternates by generation. In the example given, the dollimja was the second syllable for the given name for the 46th generation and the first syllable for the given name for the 47th generation. Here’s my question: Is it always true that when the dollimja is the first syllable that the generation will be an odd number and when it is the second syllable the generation will be an even number? Good question. Normally the pattern follows your description with every other generation alternating which syllable of the 2-character given name gets the DolImJa (돌림자) designated for that generation. You can look for the patterns in the HangRyeolPyo (항렬표), which is normally in the genealogy record. You can also find HangRyeolPyo’s for the bigger families/clans/branches at http://www.surname.info. An example that doesn’t follow the pattern you noticed is the Gwon (권) family from AnDong. They alternate putting the DolImJa 1st or 2nd every 8 generations. You can see that pattern in a table near the bottom of the following webpage where the circle specifies the position of the character selected for that individual’s given name and the character specified in the HangRyeolPyo is the DolImaJa for that generation: http://www.surname.info/2080-0248/gwon/andong.htm. Here is the same example of a HangRyeolPyo on the right page of the actual genealogical record (in this case a SaeBo collection of many JokBos for a family): https://familysearch.org/pal:/MM9.3.1/TH-1942-21736-5492-93?cc=1398522&wc=MMRT-PDC:120340738. Notice that in this case the pattern (shown by the poisition of the O’s in the 1st or 2nd character of the given name) alternates every 8 generations. So, at the end of the day each family can designate their own patterns. They were mainly trying to keep a consistent pattern that gives balance and even beauty to the structure of the genealogical family record. Not all names given actually follow that discipline, but a lot of them do. What does Dollimja mean? I’m half Korean but my mom and I never got into talking about Korean names or naming conventions. She went traditional American and took on my father’s last name, and I have a first, middle and last name, as opposed to her who only had a first and last name (all her siblings only have 2 names). I’ve been going through your page, Jason, but Korean is all so foreign and weird to me. You make it seem so easy, like, “Just go here, and click on this, and insert that, and look around…” but I can’t read Korean and the characters can become very overwhelming. I do have your site bookmarked for further reading. I’m TRYING…bear with me. I know we’ve been communicating through your FB page, but you’re the first person who actually responded to me regarding all my Korean genealogy questions, after years of searching. I hope I’m not bombarding you with messages. DolImJa (돌림자) is a character (syllable) that comes from a family’s HangRyeolPyo (항렬표). The HangRyeolPyo for each family designates characters that represent generations. So, for example, if a son in the 34th generation is born and you want to choose a name for him, go to the family’s the HangRyeolPyo table in the genealogy record (JokBo), find the 34th generation, and then look at the character there and use that as one of the syllables in the child’s name. That way if someone in the extended family just knows his name, they will know what generation he is in (and his rank in the family, kind of). The HangRyeolPyo table will tell you if the character for that generation should be the first or last syllable for his name. Normally each generation alternates if the DolImJa (generation designated syllable) is the first or last syllable of their given name. There is an artistic element to it — following these patterns of naming brings beautiful patterns to the whole genealogical record. It symbolizes harmony and balance in the family, etc. Thanks for your advice. I found a HangRyeolPyo online for the family I’m researching, SunSan Kim (선산김) at http://www.sunsankim.org/. I thought I’d be able to deduce which branch (파) my family came from since I know my grandfather’s name and my uncles’ names. But of the three possible branches, the DolImJas are too far apart and, in the third case, the order is reversed. One branch has a DolImJa cycle of 18. The possible DolImJa for my grandfather is 4th and the one for my uncles is 12th. A second branch has a DolImJa cycle of 16; the possible DolImJa for my grandfather is 4th and the one for my uncles is 16th. And the third branch has a DolImJa cycle of 14. Here, the possible DolImJa for my grandfather is 9th and the one for my uncles is 7. I’m not sure what to make of this information. Can you offer any insight? Sorry for my delayed response. I’m in the process of moving, which has kept me a bit busy. Your approach of using DolImJa’s to try to narrow down which Pa someone belongs to is a good approach. It is really useful when that works. Sometimes it doesn’t work, because not everyone follows the pattern prescribed by the HangRyeolPyo when giving their children names. If you scan thru the JokBo for the family you can get a feel for how closely the family tends to follow the patterns in the HangRyeolPyo. It is not uncommon to find names that don’t follow the pattern, but usually enough follow the pattern to make it the best way to start a search for narrowing down which Pa to look at. The interesting thing about the HangRyeolPyo for this family is that it doesn’t appear to specify which character (1st or 2nd) should have the DolImJa character in the given name. We could verify that by looking at the JokBo itself. https://familysearch.org/search/search/index/catalog-search#searchType=catalog&filtered=true&catSearchType=subject_id&searchCriteria=1283537 . It looks like they are mostly microfilm instead of online, but at least you can loan the microfilm for a small fee and view them at a library or a family search genealogical library near you. I was excited to see a KyaeBo (a collection of JokBo from all of the major Pa branches in one book for a family) for the SunSan Kim family. This is good news, because you can find all or most of the Pa branches in one book, so you might not need to be able to narrow down to a Pa to find them. The KyaeBo is on family search at https://familysearch.org/search/catalog/show?uri=http%3A%2F%2Fcatalog-search-api%3A8080%2Fwww-catalogapi-webservice%2Fitem%2F2062136 However, when I clicked on the microfilm number it said it didn’t exist (?). Maybe someone at family search can help you solve that problem. It would be great if they have it for you. I have had success in the past looking thru almost every page of a KyaeBo and finding the name I was looking for. It is a lot of work, but it is so rewarding when you find them because you can usually easily identify their ancestors for many generations once you locate one person in the chain. I hope that helps a little bit. I have had similar frustrations in cases where the person I was looking for didn’t look like their parents used the DolImJa as prescribed by the HangRyeolPyo. Sometimes I found their name in a generation that wouldn’t have been predicted by the DolImJa. Of course, you can’t do that unless you get hold of the JokBo for your Pa or KyaeBo for your family. If you have more specifics (names of people, their relationships, approximate dates/ages) I might be able to help more. You could email them if you don’t want to expose their names publicly on this site. I’ve been going through one of the genealogy records available online at FamilySearch for another family line and I keep seeing the following hanja: 尚. I ran the Korean definitions from hanja.naver.com through Google translator and I’m still lost. I see that one of the meanings is “marry” but don’t know if this is the correct meaning or how to read the record in this context (eg: https://familysearch.org/pal:/MM9.3.1/TH-1961-25458-11929-47?cc=1398522&wc=MMRT-PVX:283927864 or https://familysearch.org/pal:/MM9.3.1/TH-1951-25458-10583-31?cc=1398522&wc=MMRT-PVX:283927864). Can you shed some light on this matter? In this case 尚 is the first character of a son’s given name. It looks like the top generation row of each page does not include the son/daughter (子 / 女) characters before the given name in the family registry (JokBo 족보) you referenced. It is just assumed that the top generation row refers to a male, so they can omit the 子 character on that row. The 尚 character (found on page 78 of the Korean Genealogy Guide under “상 Sang”) is the first character of a given name in this case. Since it is repeated so often it might be on the (항렬표 HangRyeolPyo). The website for that family doesn’t list the full table ( http://kyoungjuchoi.com/sub4_5.htm ), but even if it isn’t on the table it appears that the grandparent of that family chose that character for the first syllable of given names for the grandsons in that family, which is why you would see so many of them on and around the page you referenced. There are many possible definitions for 尚 found at http://hanja.naver.com/hanja?q=%E5%B0%9A , as you discovered. The most important thing is realizing that it is the first syllable of a given name (which can be verified by looking it up in the given name table of the Korean Genealogy Guide), but it is interesting to find the meaning anyway. When you look it up in hanja.naver.com you see “오히려 상” next to 尚 before it lists a bunch of definitions in Korean. 상 is the Hangul (phonetic Korean spelling that gives you the pronunciation) version of 尚. There are many different hanja that could have the same pronunciation as 상 (Sang), but in this case it is it is 尚 which has the definition 오히려. 오히려 is generally translated as “more”, but more meanings 尚 for can be found at http://dic.impact.pe.kr/ecmaster-cgi/search.cgi?kwd=%BF%C0%C8%F7%B7%C1 . Here is an example of how to translate one of the records you referenced at https://familysearch.org/pal:/MM9.3.1/TH-1961-25458-11929-47?cc=1398522&wc=MMRT-PVX:283927864 . I’ll use the individual listed at the top right. 1) Convert the HanJa (Korean Chinese characters found in the genealogical record that give you precise meaning) to HanGul (Simple Korean phonetic characters that give you the pronunciation and are easier to look up in online dictionaries to find meanings in English). I used Capture2Text on-screen OCR to capture the HanJa characters automatically, where possible. The quality of the image isn’t good, so some characters were too blurry or faint for OCR to detect the correct characters. Some worked after adjusting the zoom of the image on the screen. For those that didn’t work with on-screen OCR, I drew the character on http://hanja.naver.org. If you have trouble getting that site to recognize the character you draw correctly, use the correct stroke order and direction. 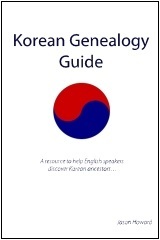 Rules are found on page 46 of the Korean Genealogy Guide (http://koreangenealogy.org/book/ ). HanJa for the record we are translating (found at the top right of https://familysearch.org/pal:/MM9.3.1/TH-1961-25458-11929-47?cc=1398522&wc=MMRT-PVX:283927864 )are listed in the next below. Note that 孫 was not clear on the original image, but I knew that it was a family surname because it was followed by 氏(Sshi, meaning “Mr.” “Mrs.” or family). Since I knew I was looking for a family name, I searched the table of family names in the Korean Genealogy Guide and found it on page 56. That was much easier than trying to draw it based on a blurry/faint/poor image. As an added bonus for realizing that Sshi was preceded by a surname, we can also deduce that the surname is probably preceded by the city where that family originated. We can go to http://jokbo.skku.edu/ENG/, http://www.shinjongwoo.co.kr/html/search.html, or http://www.surname.info/2080-0248/surname.htm (using the link found at http://koreangenealogy.org/links ) to find lists of families with the last name 孫 (손, Son). You can find the list of Son families (preceded by the city where they originated) at http://www.shinjongwoo.co.kr/name/sa/sam.html or http://www.surname.info/2080-0248/son/son.htm . I found the 密陽孫 (밀양손) family listed there, which matched the two characters preceding the Son family name. That was easier and more informative than just drawing the HanJa characters in hanja.naver.com. Shil) was found on page 84 and密 (밀 Mil) on page 74. 匕元 (비원 BiWon) or 上元 =상원 SangWon) I was hoping this would be a ruler’s name so that we could determine the exact solar year, but it doesn’t appear to be. It might be referring to the state of the moon on the 15th. 壬戌 = 임수 ImSu; Using the lunar calendar tables in the Korean Genealogy Guide starting on page 109, you can determine that the first character represents the 9th heavenly cycle and the second character represents the 11th earthly cycle. The 59th year of the 60 year lunar calendar cycle contains that combination. The 59th lunar year could be any of the following A.D. solar years: 62, 122, 182, 242, 302, 362, 422, 482, 542, 602, 662, 722, 782, 842, 902, 962, 1022, 1082, 1142, 1202, 1262, 1322, 1382, 1442, 1502, 1562, 1622, 1682, 1742, 1802, 1862, 1922, 1982, 2042 . We need another clue from the text to narrow down that list to one solar year. Clues could be the solar year in HanJa characters (not found in this record), a king’s reign (not found in this record), or finding the year of another person in the record who is related so that we can rule out years that wouldn’t make the relationships and their timing consistent. Sometimes knowing the year the record was published can help you determine the last generation. Most often, the most recent records have the solar year specified and you can use birthdates and age calculations from preceding generations to narrow down possible years when only the lunar year is given. Try to find anything that can help you narrow down the solar year options. 三月十五日生 = March 15th Birth date; use the “dates” section of the Korean Genealogy Guide (starting on page 108) to translate this using tables. The 生 (생 Saeng) character means birth, so we know the preceding information is a birth date. That is our clue to look up the lunar new year characters, which would have been difficult to translate otherwise. Wife = 室密陽孫氏 = 실밀양손씨 Shil MilYang Son Sshi; Son Shil (Given name 室실 Shil, Family name 孫 손Son of the 密陽 밀양 MilYang 孫 손 Son line. ); Sometimes this is the wife’s name, sometimes it is her father’s name, and sometimes both are listed. Note that the given name Shil is in the given names table and the family name Son is in the surnames/family names table in chapter 2 of the Korean Genealogy Guide. the online version of your book is really helpful, thanks for making it available in this format. i’ve been trying to understand a jokbo on microfilm that i got from Family Search and one thing that is really confusing is that there aren’t any O to show divisions between sections of the record. the jokbo has twelve columns per page, usually of one character in width, occasionally two. are there other ways to show divisions? a second question i have is that there are a lot of 之 and i see from the bravender translator that it’s used to mark possesion, ie: ‘s, but i’m not really clear on how the possessive is used. is it equivalent to the apostrophe in english? Thanks. Can you send me a sample (scan, photo, or whatever) so that I can help translate it? At first glance, I think you are right about the character you’re researching (之, 지). It has many definitions, but a common use of it today would be a possessive meaning, as you suspected. It is the Chinese character (HanJa) version of 의 in Korean, which is a lot like ‘s (possessive) in English. Another use is “and” or “and also” (그리고 in Korean), which would make it a good divider between sections of the record. and your last posting was really helpful too. thanks! My birth mom is 46 this October. She was born in Seoul and found by the Korean Police when she was 3 on the streets abandoned. She was then taken to a catholic orphanage where she was adopted by Americans. Is there any chance of finding my biological family? I was wanting to get my children’s names tattooed on my arms in Hanja. How can I make this happen. I’ve looked online and came across your site! Any way I can get the hanja fonts you have for names in a larger scale? You can copy & paste it into MS Word or something like that then change the font size if you want to print it larger. If it doesn’t show up in the font you want, you can search for Korean or Chinese True Type fonts for free and there are a lot available for downloading. You can install the .ttf file and use it in MS Word, Wordpad, or any word processor. Hi, thanks for posting this helpful site on Korean genealogy. I have 3 volumes of genealogy (jok-bo) that are in hanja (Chinese characters). I’m too busy to tackle translating it myself, and was wondering if you know of any reputable individuals or companies that offer jok-bo translation services for Hanja-to-Hangul. I’d like to get them all translated as soon as possible. Thanks for your advice, and feel free to answer in a private message via email if this is something you’d rather not post on the site. Thanks! I’m attempting to help my mother in law search for her family in South Korea. I don’t know where to start and hoping someone can direct us. All we know is she was born in Namhae. She had 1 sister. Last name is Yi. Any help in pointing us in a direction would be sooooo helpful. I forward to sharing stories. I am looking for help in searching for my father. I am Korean from my father’s side. He was my mother in Saigon during the Vietnam war. My mother has only scant details about him, which makes the search difficult. If you have suggestions, please let me know. Hi i was wondering how i can look up my past family? I was adopted and im not sure how i can find my past family. I would really like to know who my korean family is. Would you happen to know where I can find open source computer program source code for Hanja –> Hangul converter? I just use hanja.naver.com . Hi Jason, this is a good website you have here. I just want to ask if you have any idea where the UMs originated. I’m looking for my father Um Ik San and he’s from Busan but I couldn’t find anything related to him. I’m looking for options and will try to contact some news papers/private investigator. I already contacted one private investigator but I’d like to see first if there are ways which I could do it myself. After all, I’ll be going to Seoul this November. Please, if you have any suggestions, do let me know. Appreciate it. A search for “죽산음씨” reveals a family organization: http://cafe.daum.net/oneeum . What a great way to meet the family and find relatives!!!! I’m a third generation of Koreans leaving in Uzbekistan, after deportation of the Koreans from Far East into Central Asia during the Soviet time back in 1937. The father of my grandfather was repressed at that year, and since that we have lost all the roots. The only information we have – is that we know that my grand-grandfather was educated, because he was teaching agriculture in the far east. He even wrote the article on agriculture in the local newspaper in the far east. We have a copy of that. do you think we have a chance to find the roots? This case is really interesting. There are two HanJa versions of 량 for different families: 梁 or 樑 . (Ref: http://koreangenealogy.org/book/names/family-names/ ). Ryang is not a very common family name, which actually increases your chances of finding your roots. Interestingly, the surname 양 shares the same HanJa 梁 or 樑 . Some 양 genealogies are at https://familysearch.org/search/image/index#uri=https://familysearch.org/recapi/sord/collection/1398522/waypoints . How difficult and have you received many inquiries regarding finding birth parents of Korean adoptees? Thank you and was wondering if this would be one way to help. So far I have not found a good way to find parents of Korean adoptees. My focus has been translation of ancient records, and unfortunately I am not an expert in finding people who currently live in Korea. If you discover good resources for that please share them, as we get a lot of requests for that. Hello my name is Taylor Shreve, and my grandmother is form South Korea and she married my grandfather from America and came here. Her name was Sam Mook Lee born 1939 or 1941 and I can not find her parents names or siblings, and I really want to. I am writing this to ask how I would go about searching for my half brother? He was born in South Korea to a lady named Gene we think. My Father’s name was Robert Webb. He was Air Force United States stationed in Kempo Air Force base 1959-1964 somewhere around this time. I know that he had a son there. Sorry but this is all the information I have. Please I would really like to know my brother and I hope he is looking for us too. I was wondering if you would be able to share any resources for discovering what the next dolimja in my family should be. I do not read Hanja so I can’t do much researching on my own through actual records. My siblings and I all have 정 as our first syllable and my father and his siblings all have 진 as their second syllable. I do not know what clan my family is from and neither does my father, but our last name is 임 (Hanja character 任). I was wondering if you could help. I’m getting married soon to a korean and her parents want our kids to have traditional korean names (as their legal middle names) but my extended family is all out of contact. Any help would be appreciated. Thank you! I am interested in finding my biological parents in Seoul Korea. I have all the documentation that I can mail to you. My sister and I are twins. Can you please help us find our mother and father. Please send me paper work so we can find our parents. Please do not email me, I would rather have you mail all the processed paperwork to me and if there is fee involved which I hope not please let me know. I am a Vietnamese. I was unable to find a solution to read old Vietnamese genealogy books written in traditional Chinese characters. So I was very pleased when listening to your tutor of “Using HanJa Korean Characters in Korean Genealogy” in Youtube, especially using the Capture2Text OCR software. I am very excited with your solution. Because I think that the old Chinese characters using in the ancient Vietnamese time are just the traditional Chinese characters (Hanja) mentioned in your tutor. But so far I cannot use the Capture2Text software to capture the traditional Chinese characters yet. You advice is to choose the chinese(NHocr) option, but I cannot find it in the Captute2Text version v3.8 or v3.5 OCR list. So I where I can find the appropriate Chinese(NHocr) file (corresponding to Capture2Text v3.8) and how I can install it on the Capture2Text v3.8? My new book called “Separated Lives” is a true story about the adoption of a baby boy and years later a friend taking him on a fascinating but uncertain journey to search for his birth parents. It is available from Dorrance Publishing (in Pittsburgh, PA) http://www.DorranceBookstore.com, Barnes & Noble barnesandnoble.com and Amazon.com. My name is Mike Minnick. I live in Utah. My wife is adopted and we have paper work from Holt in soul Korea. It is limited information. A police office found her on the street. She was about 3. I think we will need to go the DNA route. Hoping to see if you have suggestions. Or if I could pay you for helping us. Or pay someone you may refer to us. You have my e mail. My phone number is 801-918-7888. Looking forward to speaking to you. Trying to find my wifes family. To fill that big hole in her heart. Which you understand very well. Can anyone help me find more info on my paternal grandfather Kyung Hak Yoon? I think he left Korea in 1903. He came in to the US through San Francisco. He first moved to the Sacramento area, then to Reedley, a small town in the California Central Valley. I know a lot about my maternal grandfather Choong Sup Park since we have the Park Family Jokpo. Choong Sup is Miryang Park Clan from Jeon Ju. According to the Jokpo, Choong Sup’s first ancestor was On-Bu Park in the 1100s. On-Bu is listed in the Jokpo as the Prime Minister of Goryo. Any help or assistance would be greatly appreciated. I am going to be in Korea for a couple of months and would like to try to look for the jokbos for my husband’s family. ( We only have 2 right now) Do you have any suggestions for how to start tackling this? I don’t know where to begin! We will be in Daegu for the majority of the time but I would love to take a few trips up to Seoul if it would help with research. Hi can you tell me what more about the given name Nyu. Also what about the name Ae, what does that mean. Ae is 애, which could be any of the following Hanja characters: 愛 哀 涯 厓 崖 艾 埃 曖 碍 隘 靄 . A common one is 愛, meaning love. Meanings include: http://hanja.naver.com/search/keyword?query=%E6%84%9B%20%20%E5%93%80%20%20%E6%B6%AF%20%20%E5%8E%93%20%20%E5%B4%96%20%20%E8%89%BE%20%20%E5%9F%83%20%20%E6%9B%96%20%20%E7%A2%8D%20%20%E9%9A%98%20%20%E9%9D%84 . Hello! My name is Jessica and I’m writing to you on behalf of my husband, Tim. Tim was born in Seoul Korea on May 2, 1977. His Korean name is Park Hee Hyun and he also has a case number on his paperwork from HOLT K77-1262. He was placed into a foster home on May 4, 1977 two days after his birth. He was not at an orphanage, maybe just at the hospital where he was born. Notes say “placed the baby in F.H. from U.P.” and “passed physical examination by Dr. Cho Chung Soon.” There is also a note of his previous history as Mapo Reception Center. ( He was eventually adopted through Holt) His social worker’s name was Kang Hae Won. Here is some information about his foster home: “The foster house is located in a residential area, about 40 minutes away from our office by bus. Foster parents are 67 and 57 and their one son at 23 are family members of this foster home. All the foster family members love our Hee Hyun very much. The foster mother has taken care of several Holt children already.” What’s interesting on this note is that it was written by Kang Hae Won and translated by Park Young Sa. I don’t know if that person was any relation, as I’m aware Park is a common last name in Korea. He was adopted by Carol and Richard Handly of Connecticut and arrived in America on August 30th, 1977. His American name is Tim Handly. Tim and I recently had a daughter Ceili, and we tried Ancestry DNA, but we thought we would also try here for any information we can get about Tim’s biological relatives. Parents, siblings, cousins, etc. I hope you can help! Thank you! Hello! Your post is very interesting to me as I was also adopted from Holt with a very similar background, ex. Case no., name of Dr., caregiver, etc. I would be very curious to know if you ever found anything about your husbands birth family? Coincidentally, my birth name was Park Mi Jung and I was adopted at almost three years of age. My name is Paul, 61, came to U.S. 1996. Do you need help translating your precious JokBo? Can you send a picture of the title on the cover of it so that I can see if it is online to help with translating it? My name is Emma. I am trying desperately to find my birth family. I have reached out to KAS but hit a dead end. I was born in 1986 in Yangsan, s. Korea. Any tips on possibly finding them? My mother did not register so it’s impossible to track her down. I wrote earlier that my Grandfather Young Han Choo was counsel general s/b Consul General. Do you have a feeling or an observation about how often courtesy names (rather than given names) are used in references to the wife’s 사조 or the daughter’s husband and/or his father? I have seen both used but wondered if you have noticed any trends. You have a good question. JokBo record practices can vary widely from clan to clan. I generally see courtesy names used a lot for the males in many family records. Hello! I have appreciated your book and website as it made it possible for us to start translating a jokbo. I am currently in Korea for the next two months and would like to start working on finding other jokbos or documents. (we only have a jokbo for two of our lines, but on one line we don’t know where we fit into the jokbo) Do you have any experience researching in Korea? Where would you recommend that I start? Greetings! My name is Vasilios Bakagias, and I am a poet who lives in Greece for the time being, where I care for my elderly father, whose name is Vaios Bakagias. My father served with the Greek reserves during the Korean conflict in the 1950s, and, come to find out, he had children with a woman who is now lost in the mists of our family history, and in all likelihood, are still residing in South Korea, and would be half Korean, and half Greek. I have no earthly idea where to even begin searching for my Korean kin, and I would be very grateful for any assistance whatsoever for the unknown relatives. I look forward to your reply! I’m looking for recommendations for Genealogists in Korea (Seoul preferred). Do you have any that you can provide? I don’t know of any in Korea, unfortunately. I might be able to help remotely from the U.S.